CG Blockchain, Inc., a New York-based firm building powerful sets of blockchain-based services and tools for the financial services sector, has announced that its affiliate, BCT, Inc., has raised $31 25 million at the close of the online public sale of its (BCT’s) BCT ERC20-compliant utility token. According to a press release CoinReport received from Transform Group, CG Blockchain’s PR firm, the sale started April 1 and the tokens will be distributed at the end of May. Prior to the distribution date, BCT will carry on consultations with concerned parties that consist of distribution partners, beta testers and exchanges, who could yet purchase the token past the end of the public sale. For these potential purchasers, the firm has set a cap of an extra $20 million. 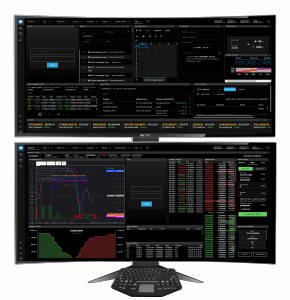 BCT provides an all-inclusive collection of exclusive and third party application tools for wealth management firms, hedge funds and other institutional traders to trade digital currency via its Blockchain Terminal, an integrated, single interface for trading digital currency across 65 main digital currency exchanges. ComplianceGuard is one of the third party applications intended for the terminal. It is owned by CG Blockchain, the first software developed to supervise desktops of traders while recording all transactions to a private blockchain, making transactions irreversible. The terminal and software are presently operating with a handpicked group of traders and hedge funds that manage about $1.8 billion in assets. CG Blockchain is also dynamically working with firms such as algorithm marketplace Tradingene and computer technology corporation Dell for extra features and markets. The terminal ledger is primarily powered by the BCT utility token. The terminal also comprises a secondary ERC20-compliant coin that signifies subscription and entitlement to the services offered by the native BCT token. The secondary token is available since the launch of the platform. Together, both the coins protect integrity and offer incentives for the accurate operation of the terminal platform. Bonomo added, “Given the current turbulence of the ICO market, we couldn’t be happier about the response to the Blockchain Terminal token. We want to thank all of our advisors, partners, employees, and token participants for their efforts during this process. Edit: The press release, and hence the previous version of this article incorrectly stated the total amount of funds BCT raised was $31 million. The correct amount raised ($25 million) has been mentioned in this version of the article. The number 32 has been stricken through in this version (in the headline and in the first paragraph, to be exact), instead of removing it, for convenience of the readers who had read the earlier version and may need to refer to the article again for any purpose.